In the new issue of Die Cast X—on sale later this week and available now digitally HERE—we review a model of Mercedes most magnificent limousine, the legendary 600 Pullman. But that vehicle ended its 18-year production run twice that many years ago. In more recent times, Mercedes’ parent company Daimler put forth another of its subsidiaries—Maybach—as its premiere luxury brand, but truthfully it shared too much mechanically and visually with Mercedes products to distinguish itself as a step up in allure and price. After a decade of struggle, Daimler suspended production on the Maybachs in 2013. But to the surprise of many in the automotive world, and following a redesign of the flagship Mercedes S-Class sedan, Maybach was re-introduced—this time as a sub-division of Mercedes in 2016. Mercedes-Maybach became a dedicated luxury division in much the way Mercedes-AMG is the company’s performance division. The family resemblance is still unmistakable, and now not a marketing liability! It comes in two trims—the S550 and the S600. Opt for the latter (and fork over an extra $25k) and you get four extra cylinders, (12 versus 8) and almost 20-percent more power and torque—plus the exclusivity of owning the most luxurious Mercedes sedan sold. 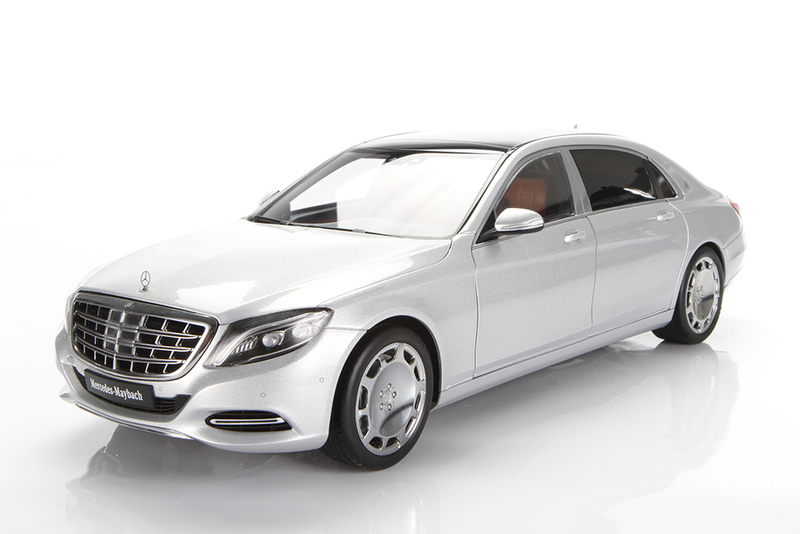 No one produces more current model Mercedes replicas than does AUTOart. 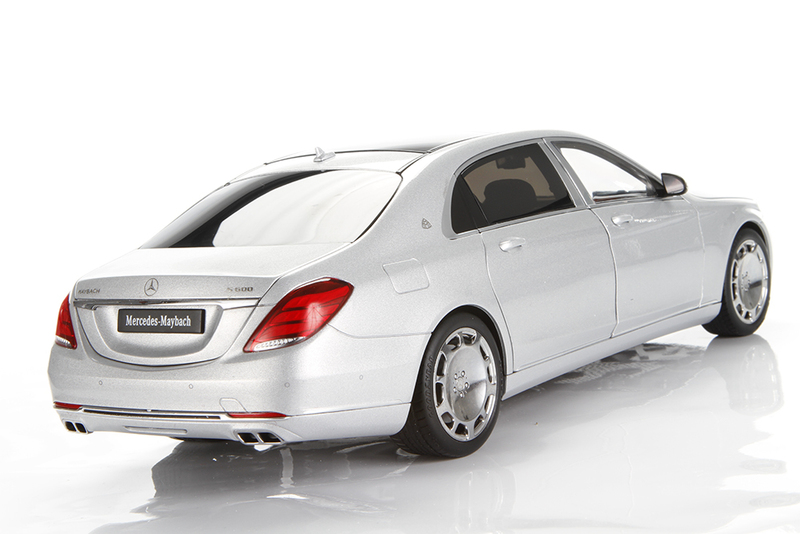 To mark the return of the Maybach nameplate they have produced a Maybach S-Class in 1:18 as part of its composite series. Shut-lines and fine details are excellent, and the interior treatment is befitting a $200K luxury limo. 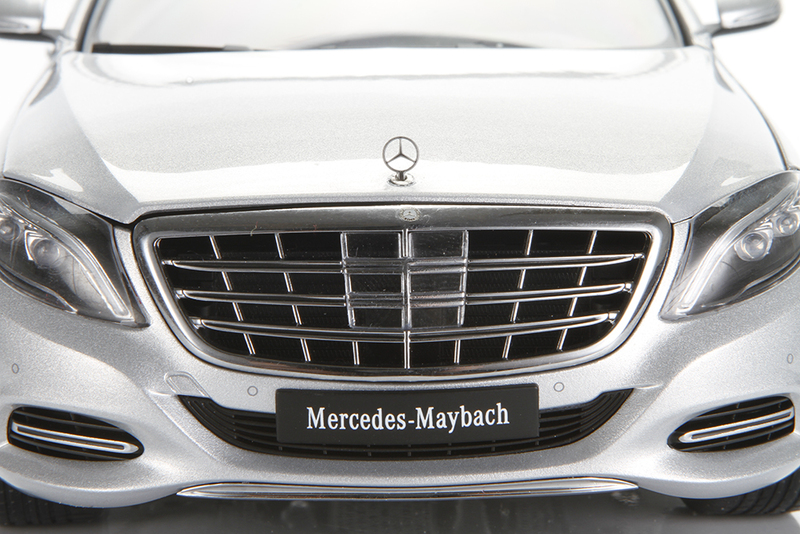 All emblems are etched metal on this replica; traditional Mercedes three-point stars are found on the hood and trunk, but Maybach emblems adorn the C-pillars—which are 8.1 inches further back from the B-pillars than on a standard S-Class. Those B-pillars are chromed, and the rear doors have been shortened (yes, you read that right) so that they don’t intrude into the C-pillar—creating a cocoon for rear passengers that shields them even when the doors are open. To make that work, small fixed triangle windows fill the notch in the C-pillar. The odd (but perfectly accurate to scale) blank panels in the center of the metal grille house the cameras and sensors for the adaptive cruise control and semi-autonomous driving modes. The doors have a light feel to them, which is the only real giveaway that the body is not metal. 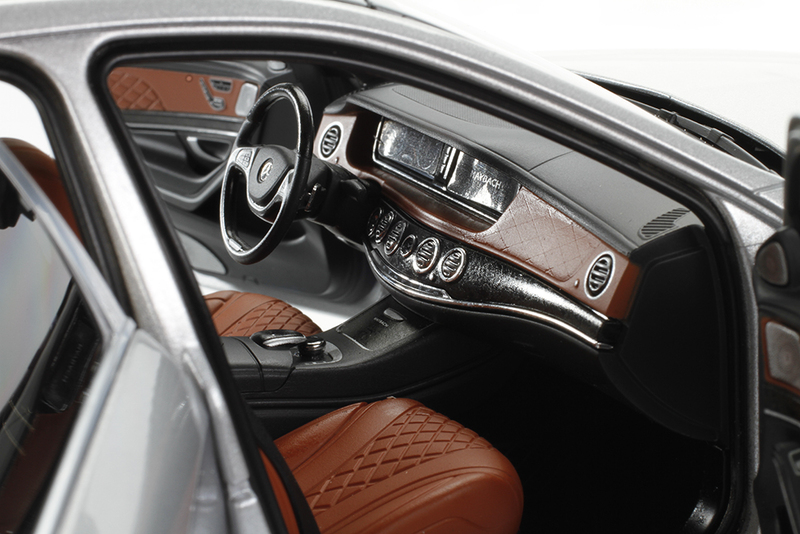 The interior simulates diamond-quilted leather with soft and hard plastics of various textures. The rear seating is fairly cavernous (as you would expect of a car a reviewer on Jalopnik.com claimed “God’s Dad’s Boss would ride in.”) Opening the rear doors reveals where those 8 extra inches of length got used; the rear passengers enjoy heated and cooled power reclining seats with built-in foot rests. A pair of 8-inch multimedia screens are built into the seatbacks and the floor mats are sheepskin. The rear windows are heavily tinted so passengers can enjoy the sumptuousness in complete privacy. The Maybach S-Class comes in 550 and 600 flavors; AUTOart’s is the latter, denoting the presence of the 6.0L V-12. This is the same “venerable” (code for ‘old’) SOHC 3-valve-per cylinder V-12 that has been powering flagship Benzes for more than a decade. Now, fortified by twin turbos, it produces as much as 621hp in AMG 65 trim, but in the Maybach it’s tuned for quiet, seamless thrust so it’s been dialed back to “just” 523hp (the same as in the standard S-Class). That’s plenty. Despite the Maybach’s serene demeanor and 5300-pound heft, that’s enough kinetic wherewithal to whisk its occupants away from the envious stares of the masses and on to 60mph in less than 5 seconds! 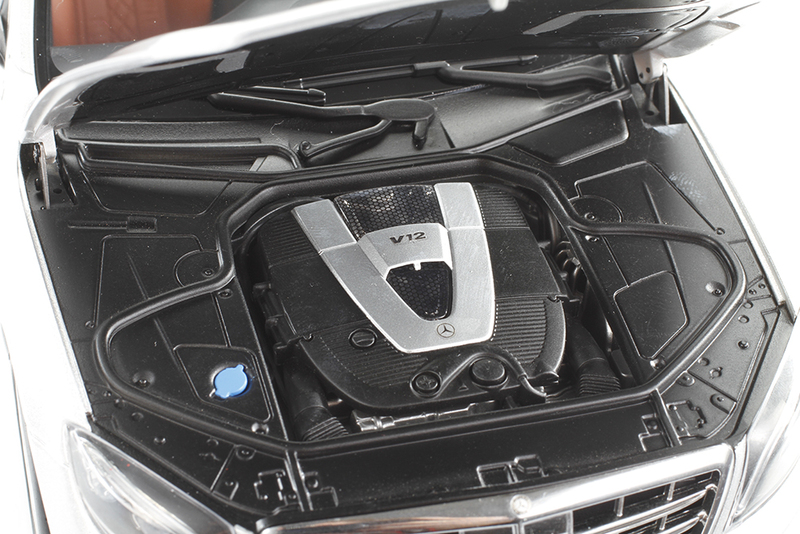 As with the full-size S600 the V-12 is obscured by a stylized modesty panel, so you can see only hints—the fronts of intake snorkels that feed the turbos and the outlines of the top-mounted air-to-water intercoolers, for example—but overall there isn’t much to see underhood—in real life or here in scale. If the motor is a bit underwhelming, the rolling stock is anything but! 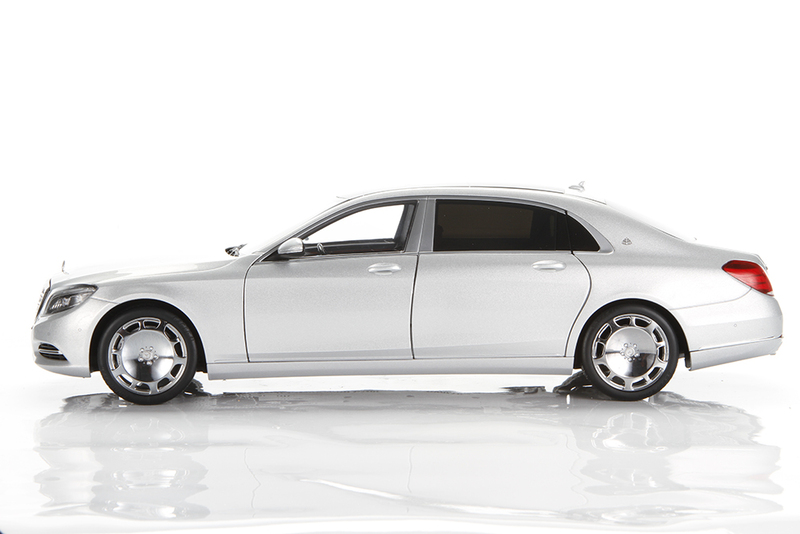 The car can be had with standard S600 wheels, but the optional Maybach-exclusive 20-inch slotted dish wheels are exquisite and expertly rendered here. They are wrapped in staggered size Goodyear Eagle F1s which are correct right down to the sidewall markings! The Maybach is unique for any number of reasons—not the least being that the overwhelming majority of those who buy one will never actually drive it. (They have people for that.) As a stand-alone marque Maybach couldn’t manage to differentiate itself sufficiently to earn the status it sought—in part because Mercedes’ flagship S-Class was already so good! Since it couldn’t beat ‘em, it went ahead and joined ‘em—becoming a division of the parent company rather than a rival spin-off. And in that capacity it excels; the Maybach takes the best the S600 has to offer and takes it up a notch or two in comfort and technology, while still capitalizing on the Mercedes reputation and handsome styling. 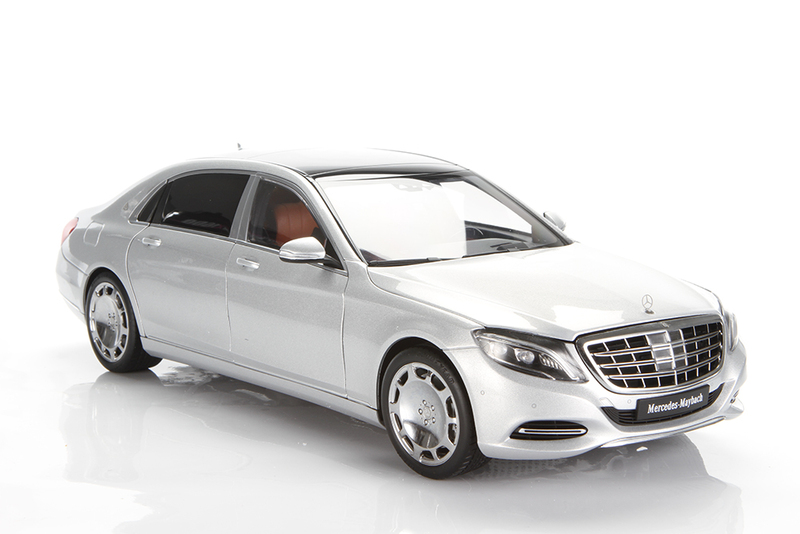 AUTOart has long been the master of modern Mercedes diecast, and this most luxurious model is a perfect addition to the range. The choice to make it part of the composite series is interesting, but it makes sense when you realize that despite its family resemblance to the standard S-Class, the Maybach shares no body panels with it aft of the windshield. That means an all-new casting—which would have added at least another $100 to the price tag had they tooled up for a metal body. Aside from the light feel to the doors you honestly cannot tell, so we’re ok with the choice. And we’re more than ok with the result—this model is beautiful!